RURAL VILLAGE LOCATION - In need of modernisation - 3 Beds, En-suite, Bathroom, Cloakroom, Lounge, Dining Room, Kitchen, Swimming Pool, approx.1/2 acre grounds, must be viewed. 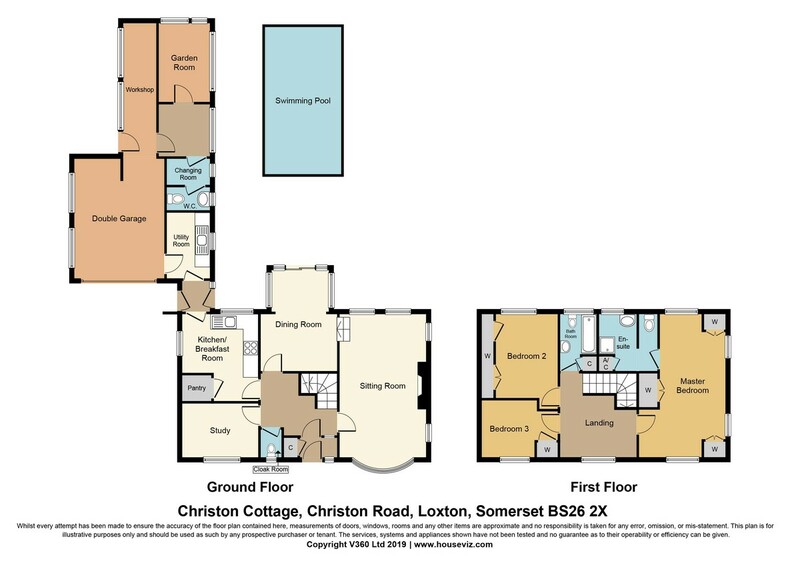 Christon Cottage is a 1960s style detached residence situated on the level in the popular sought after village of Loxton. The spacious property, which is in need of modernisation, enjoys double glazed windows, oil fired central heating, ample parking, double garage and workshop together with good size gardens approaching half an acre and including a swimming pool. The versatile accommodation enjoys southerly views from the rear toward the Mendips and Crook Peak. Loxton is set within a conservation area, an area of outstanding natural beauty and offers a church, country club/hotel and local garage. The larger village of Winscombe with offers shops, bank, chemist, library etc. is approx. 4 miles away. Axbridge and Cheddar are both within a short drive. Commuting to Bristol, Weston and Taunton is usually via the A38 but the M5 is accessible at Edithmead. Loxton falls in the Cheddar Valley Schools catchment area or alternatively the well reputed private Sidcot School is within easy reach. CLOAKROOM Coloured suite comprising low-level WC, wash hand basin, radiator, half tiled walls, UPVC obscure double glazed window to front. DINING ROOM 16'8x11'9 narrowing to 8'4" (2.54m) Extended to the south aspect the room enjoys views over the garden and pool area toward Mendips and Crook Peak, decorative ceiling rose, coved ceiling, inset plaster wall niche, UPVC double glazed windows to side and rear, sliding double glazed doors into the terrace and pool area, return door to the reception hall. STUDY 11' 10" x 7' 10" (3.61m x 2.39m) Radiator and UPVC double glazed window to front. UTILITY ROOM 12' 4" x 6' 6" (3.76m x 1.98m) Double drainer sink unit, plumbing available for washing machine, space for fridge and freezer, wall cupboards, side aspect window and door to Double Garage. GALLERIED 1ST FLOOR LANDING 11' 11" x 10' 2" (3.63m x 3.1m) UPVC double glazed window to front, radiator, loft access. EN-SUITE SHOWER ROOM 9' 1" x 8' 4" (2.77m x 2.54m) narrowing to 7'5" (2.26m) Fitted with white suite comprising fully tiled shower cubicle with wall mounted shower, pedestal wash hand basin, low-level WC, radiator, half tiled walls, door to shelved AIRING CUPBOARD housing insulated tank, UPVC double glazed window to rear. BEDROOM 2 11' 0" x 9' 7" (3.35m x 2.92m) Plus range of built-in cupboards with hanging rail etc, dressing table, wall light and mirror, radiator, UPVC double glazed south facing window enjoys views to the Mendips and Crook Peak. BEDROOM 3 11' 9" x 8' 1" (3.58m x 2.46m) UPVC double glazed window to front, radiator, door to fitted wardrobe with hanging rail. BATHROOM 5' 8" x 5' 6" (1.73m x 1.68m) extending to 8'4" (2.54m) Including AIRING CUPBOARD. Fitted with modern white suite comprising panelled bath with chrome mixer tap, wall mounted shower attachment, pedestal wash hand basin, low-level WC, radiator, strip light/shaver socket, part tiled walls, door to shelved LINEN CUPBOARD, UPVC obscure double glazed window to rear. OUTSIDE The property is approached over a cattle grid with a pedestrian side gate and tarmac driveway providing parking for numerous cars. FRONT GARDEN Predominantly laid to lawn with numerous flower and shrub borders and steps up to the entrance door. To the eastern side of the property there is a boiler room housing the oil fired boiler and oil storage tank. CLOAKROOM 6' 6" x 3' 5" (1.98m x 1.04m) Wash hand basin, WC and UPVC double glazed widow. GARDEN ROOM 11' 10" x 8' 4" (3.61m x 2.54m) Situated to the rear of the property with side and rear UPVC double glazed windows, polycarbonate roof and paved patio to the rear. REAR GARDENS The gardens are of good size immediately to the rear of the property and filling in the L-shape created by the utility room, pool room and garden room. There is a low retaining wall leading to a further area of lawned garden to the rear. The rear boundary is medium height and formed from stonewalling and fencing. The remainder of the garden approx. 60' 0" x 160' 0" (18.29m x 48.77m) runs in an L-shape to the property with further lawn and mature trees, shrubs and bushes. AGENTS NOTE The agents are informed that the plot approaches ½ acre in total (0.475 acre approx). AGENTS NOTE 2 The property is connected to a Septic tank, it is not connected to mains drainage. The boiler is not working it has not been used for the past 20 years.